While the Sun is indeed the origin and sustainer of life on Earth, the exposure of the Sun’s light and heat alone would not offer the stimulus to change and growth as do the tides that respond to lunar influences. Using astrological knowledge in our everyday lives will nurture and support us, just add the lunar cycle supports the growth of all living things on Earth. From the very beginning of life, Earth’s two companions in the sky-the Sun and the Moon-established two separate rhythms that continue to this day: the Sun with its pattern of heat and light, and the setting of the seasons; the Moon raising and lowering the water in and with which life is nourished. The Moon cycles and their correlations with everyday life are the foundation of the Lunar Astrology. (New Moon) The first quarter begins at the New Moon, when the Sun and Moon are conjunct (the Sun and Moon are in the same degree of the same zodiac sign). The Moon is not visible at first, since it rises at the same time as the Sun. The New Moon phase is a time for new beginnings that favor growth, the externalization of activities, and the expansion of ideas. The first quarter is the time when things germinate and emerge; a time of beginnings, and outwardly directed activity. Second Quarter The second quarter begins halfway between the New Moon and the Full Moon, when the Sun and Moon are ninety degrees apart. This half Moon rises around noon and sets around midnight, so it can be seen in the western sky during the first half of the night. The second quarter is the time of growth, development, and articulation of things that already exist. 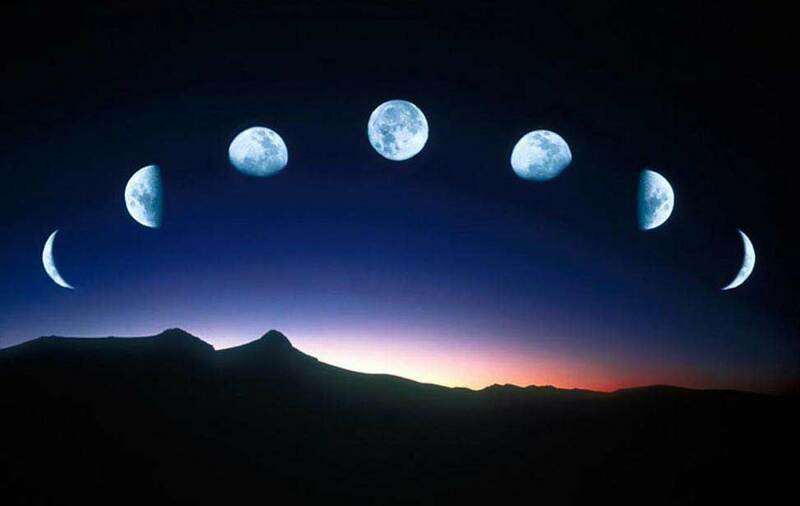 (Full Moon) The third quarter begins at the Full Moon, when the Sun is opposite the Moon and its full light can shine on the full sphere on the Moon. The round Moon can be seen rising in the east at sunset, and then rising a little later each evening. The full Moon stands for illumination, fulfillment, completion, drawing inward, unrest, and emotional expressions. The third quarter is a time of maturity, fruition, and assumption of the full form of expression. Fourth Quarter The fourth quarter begins about halfway between the Full Moon and New Moon, when the Sun and Moon are again at ninety degrees, or square. This decreasing Moon rises at midnight, and can be seen in the east during the last half of the night, reaching the overhead position just about as the Sun rises. The fourth quarter is a time of disintegration, drawing back for reorganization, and for reflection.